Unique times require a unique poetry, hence The Florida Nocturne Poems series. PEACH COBBLER IN THE POKER ROOM, composed during my July-August 2012 time in Central Florida, is another poetic core-sample of crazed and crazy America circa 2012, this time set in the state famous for the stolen 2000 Presidential election and the Trayvon Martin shooting. A world where the fundamentalist churches and the casinos and the right-wing politicians engage in an awkward Waltz of the Toreadors, fooling no one but diverting attention away from what’s REALLY going on, a power shift and wealth transfer that looks to turn the state into a third-world country with an ruling oligarchy supervised by Governor Ultrasound. This is a sparse poem in places, it’s angry in other places, and it captures a narrator stumbling through day-to-day life in contemporary Florida (kind of like a semi-tropical Texas in a minor key), trying to adapt to others’s needs and desires in the hope that that might make life go by more smoothly (it’s always easier to adapt and to turn the other cheek, he thinks)…and that smoothness helps in a nightmare world of rich people in SUV’s, Buford Pusser-esque law enforcement figures staring down from billboards, Bob Evans covering everything in thick white gravy, know-nothing politicized fundamentalist churches controlling the schools, and cloying plastic nostalgia coming at one from all directions. No wonder Myrna gets excited about the Peach Cobbler In The Poker Room. Alice, the narrator’s on-again/off-again partner, doesn’t have time for those silly and confusing Bill Shute poetry chapbooks (after all, she says, one can only willingly suspend one’s disbelief so far!) that she quietly returns, but maybe YOU DO? And if so, you can get this one for only $5 postpaid anywhere. And while you are at it, why not get the entire Florida Nocturne poems series of four chapbooks…each is chock-full of as much detail and life experience and food-for-contemplation as a feature film or a full-length novel, but they are only six-to-eight pages each, and like rich food, a little bit goes a long way…. through understatement and selectivity and synecdoche (I liked that word better before Charlie Kaufman used it) and a collage-like aesthetic, you get the feeling of getting much more than six-to-eight pages. People are busy today…attention spans aren’t what they once were. Your time might be better spent reading Melville’s CLAREL, I agree, but that was then and this is now. 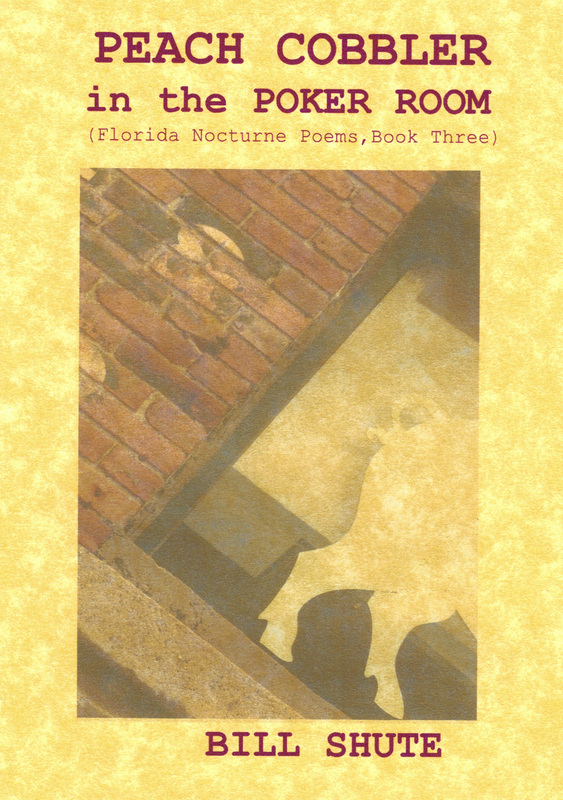 And you can’t get more NOW than this sequence of Florida-based poetry chapbooks documenting the America of 2012…true today, true next year, true next century, alas. The more things change, the more they stay the same…only the technology and the slang change.